AVTS celebrates women this August by offering free safety tests to help keep them safe on the road. 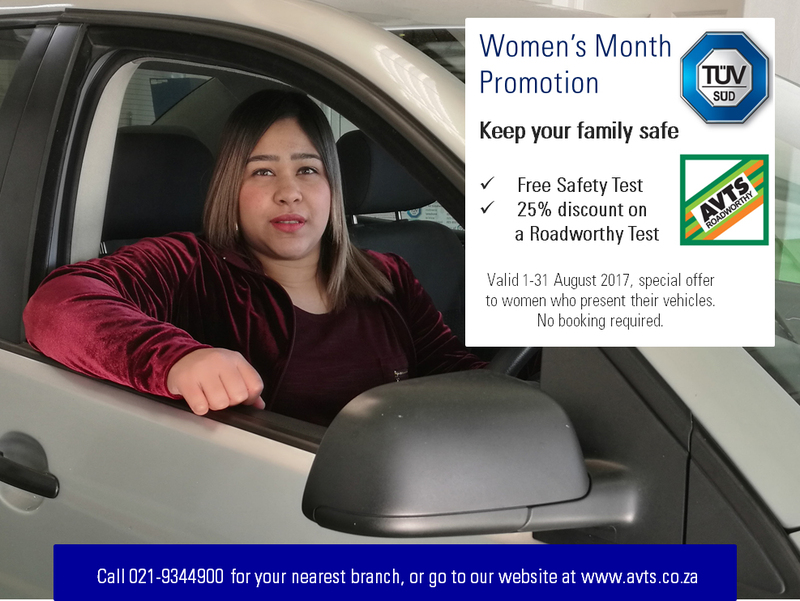 This Women’s Month, AVTS will be offering moms, wives, girlfriends, daughters and sisters FREE VEHICLE SAFETY tests, worth R200. On top of this, women customers will also receive a 25% discount on all roadworthy tests or any other AVTS product or service. The AVTS free safety check will assess your vehicle’s most critical safety features, including tyres, lights, brakes, suspension, steering and wheel alignment followed by a report highlighting any specific problems. This will allow you to make any repairs required. Maintaining your car in a safe and roadworthy condition plays a key role in ensuring that you and your family are safe on the road. In these times of extreme “busyness”, vehicle safety sometimes takes a back seat – but could save your life. In fact, regular safety and roadworthy checks will ensure you’re able to pick up problems before it’s too late. We recommend an annual check, if possible. AVTS has built a strong reputation in the industry for its uncompromising stance on safety and integrity and remains committed to saving lives. Celebrating its 25th birthday on the 12th December, AVTS will be offering several promotions and events over a period of time, which will allow us to show our appreciation to our customers, our employees and our stake-holders. We encourage all drivers to keep their eyes peeled for these promotions, and take advantage of the opportunity to ensure their vehicles remain roadworthy. AVTS employs 78 members of staff at its 7 branches which are situated in various strategic positions in and around Cape Town. Backed by ISO 9000 certification, it has received numerous accolades over the years.